Stanford University scientists have developed a "smart" lithium-ion battery that gives ample warning before it overheats and bursts into flames. The new technology is designed for conventional lithium-ion batteries now used in billions of cellphones, laptops and other electronic devices, as well as a growing number of cars and airplanes. "Our goal is to create an early-warning system that saves lives and property," said Yi Cui, an associate professor of materials science and engineering at Stanford. "The system can detect problems that occur during the normal operation of a battery, but it does not apply to batteries damaged in a collision or other accident." Cui and his colleagues describe the new technology in a study published in the Oct. 13 issue of the journal Nature Communications. A series of well-publicized incidents in recent years has raised concern over the safety of lithium-ion batteries. In 2013, the Boeing aircraft company temporarily grounded its new 787 Dreamliner fleet after battery packs in two airplanes caught fire. The cause of the fires has yet to be determined. In 2006, the Sony Corporation recalled millions of lithium-ion batteries after reports of more than a dozen consumer-laptop fires. The company said that during the manufacturing process, tiny metal impurities had gotten inside the batteries, causing them to short-circuit. "The likelihood of a bad thing like that happening is maybe one in a million," Cui said. "That's still a big problem, considering that hundreds of millions of computers and cellphones are sold each year. We want to lower the odds of a battery fire to one in a billion or even to zero." 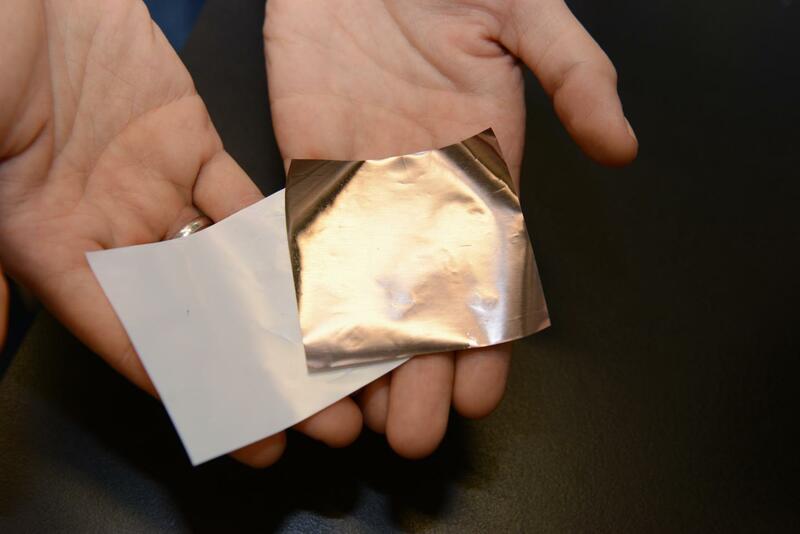 A typical lithium-ion battery consists of two tightly packed electrodes -- a carbon anode and a lithium metal-oxide cathode -- with an ultrathin polymer separator in between. The separator keeps the electrodes apart. If it's damaged, the battery could short-circuit and ignite the flammable electrolyte solution that shuttles lithium ions back and forth. "The separator is made of the same material used in plastic bottles," said graduate student Denys Zhuo, co-lead author of the study. "It's porous so that lithium ions can flow between the electrodes as the battery charges and discharges." Manufacturing defects, such as particles of metal and dust, can pierce the separator and trigger shorting, as Sony discovered in 2006. Shorting can also occur if the battery is charged too fast or when the temperature is too low -- a phenomenon known as overcharge. "Overcharging causes lithium ions to get stuck on the anode and pile up, forming chains of lithium metal called dendrites," Cui explained. 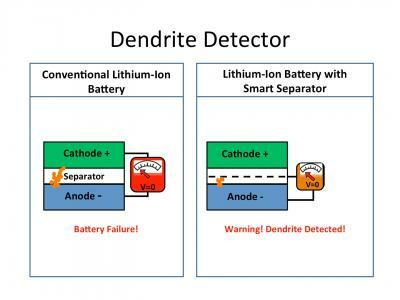 "The dendrites can penetrate the porous separator and eventually make contact with the cathode, causing the battery to short." "In the last couple of years we've been thinking about building a smart separator that can detect shorting before the dendrites reach the cathode," said Cui, a member of the photon science faculty at the SLAC National Accelerator Laboratory at Stanford. To address the problem, Cui and his colleagues applied a nanolayer of copper onto one side of a polymer separator, creating a novel third electrode halfway between the anode and the cathode. "The copper layer acts like a sensor that allows you to measure the voltage difference between the anode and the separator," Zhuo said. "When the dendrites grow long enough to reach the copper coating, the voltage drops to zero. That lets you know that the dendrites have grown halfway across the battery. It's a warning that the battery should be removed before the dendrites reach the cathode and cause a short circuit." The build-up of dendrites is most likely to occur during charging, not during the discharge phase when the battery is being used. "You might get a message on your phone telling you that the voltage has dropped to zero, so the battery needs to be replaced," Zhuo said. "That would give you plenty of lead-time. But when you see smoke or a fire, you have to shut down immediately. You might not have time to escape. If you wanted to error on the side of being safer, you could put the copper layer closer to the anode. That would let you know even sooner when a battery is likely to fail." In addition to observing a drop in voltage, co-lead author Hui Wu was able to pinpoint where the dendrites had punctured the copper conductor simply by measuring the electrical resistance between the separator and the cathode. He confirmed the location of the tiny puncture holes by actually watching the dendrites grow under a microscope. "The copper coating on the polymer separator is only 50 nanometers thick, about 500 times thinner than the separator itself," said Wu, a postdoctoral fellow in the Cui group. "The coated separator is quite flexible and porous, like a conventional polymer separator, so it has negligible effect on the flow of lithium ions between the cathode and the anode. Adding this thin conducting layer doesn't change the battery's performance, but it can make a huge difference as far as safety." Most lithium-ion batteries are used in small electronic devices. "But as the electric vehicle market expands and we start to replace on-board electronics on airplanes, this will become a much larger problem," Zhuo said. "The bigger the battery pack, the more important this becomes," Cui added. "Some electric cars today are equipped with thousands of lithium-ion battery cells. If one battery explodes, the whole pack can potentially explode." The early-warning technology can also be used in zinc, aluminum and other metal batteries. "It will work in any battery that would require you to detect a short before it explodes," Cui said.